But then again, it's apparently one way to get to Rolex. I don't know if there have been other Anglo-Arabs (half-Arab) at Rolex, but how exciting that one of the entries this year is a 15.2H dish-faced chestnnut! His rider, Lauren Kieffer, is from Mount Carmel, Illinois and she rides with the O'Connors. The story is that Snooze Alarm came to her barn as a youngster, and she rode him for her trainer while her trainer was pregnant. They didn't instantly click, but they eventually formed a partnership and her parents bought her the horse. 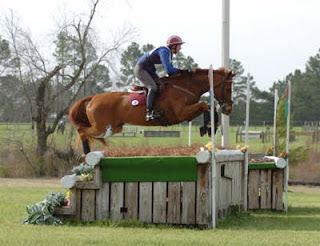 Lauren tells their story the best (see the Eventing Nation series) so I won't recount it here. They have been recognized for their achievements in eventing. In 2007 they won the Arabian Horse Association's Ambassador Award and the USET Markham Trophy in 2008. In 2009 and 2010 they were named on the Eventing Developing Rider list. Lauren was also in the news several years ago when, at Jersey Fresh 2008, she was aboard Tigger Too when he experienced a sudden abdominal aortic rupture on course. He died moments after falling as he landed from a jump, and Kieffer was pinned underneath him for a short time. She was uninjured. I hope you get to see them and tell us about them. It's great to see variety on the course. Haven't Anglo Arabs been good cavalry horses in the past? I wish them luck. Arabians are my breed of choice and I competed my 3/4 Arabian mare in open hunter shows (mainly non-rated schooling shows). So I know they can jump. They are the breed of choice for endurance racers (along with mustangs). I've wondered why eventers don't use Arab crosses more often. Maybe this pair will change that!! That is one good-looking horse!